The wide connector goes in the base of the iPod and the double-connector plugs firmly into the floor of the center armrest console. The iPod unit will boot up when the key is turned on and will take a few moments to activate. At that time, a Kia logo or an iPod symbol will appear on the screen. All controls may then be operated through the audio head unit. The iPod can be stowed in the console and “forgotten” about until leaving the vehicle. The music description from the iPod is shown on the multi-display panel of the audio of factory navigation system as applicable (Note: videos will not be displayed. The iPod cable charges the iPod’s battery when the vehicles key is on. The iPod may not turn off with the key, so confirm the iPod is off to avoid battery drain on the iPod. Each combination of Kia model, iPod model and iPod generation have unique functionality. Please refer to your Kia owner’s manual for more details. 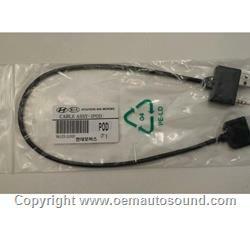 The product page states "Original OEM cable not imitation or generic this is Kia brand." . This cable is an inch or so longer than the genuine Kia cable. The photo shows a genuine Kia product with a Kia label on the bag, but the cable I received came in an unlabeled bag, I gave this product 3 stars because the cable worked...once you attached the $29 Apple 30-pin to lightening adapter, effectively doubling the price.